A stirring doubleheader of RADAR L.A. productions last night at LATC gave me a lot to think about, including this: I am left wondering if it was coincidence, curators’ choice, or larger cultural influences that gave Los Angeles an international theater and performance festival at which only two plays (of 14 scripted pieces, many involving female artists) were written by women; both women are Latin American; both of their plays look at generational trauma in the aftermath of defining tragedies in their countries; both temper their documentary materials with poetic license as they explore the intimately personal in the political. Whatever. I can thank the forces – occult or otherwise – that brought Mariana Villegas and Lola Arias to town. 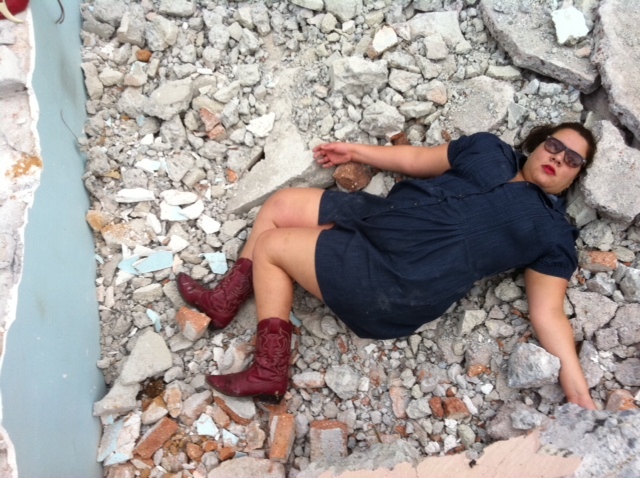 For Villegas, in her supertitled 55-minute solo performance Se Rompen Las Olas, the disaster is the Mexico City earthquake of 1985 – evoked through video news clips – that left tens of thousands dead, discredited the government, and briefly brought together the woman who would be her mother and the man whose absence and abandonment would shake the performer’s life to the core. Villegas holds the stage with a powerfully expressive physicality as when her exuberant and uninhibited dance shifts in an instant to a vision of abuse. At one point, a recorded song asks Where did the earthquake catch you? and goes on to answer dancing with Catalina, shaking the floor so hard, the singer explains, he never noticed the quake. (Can anyone imagine a comparable song in this country citing 9/11?) In Se Rompen Las Olas, these lyrics with their upbeat tune and danceable beat offer a compelling truth of daily life and human desire going on in the midst of catastrophe while Villegas, through her body and her words reminds us that people born in the aftermath of disaster continue to feel the reverberation in their lives. For Lola Arias, the disaster is the coup in Chile that overthrew the government of Salvador Allende and led to the military dictatorship of Augusto Pinochet. The supertitled script of El Año en que Nací (The Year I Was Born) is drawn from the actual lives of the 11 performers all of whom were born (or were infants) at the time of the coup and who seek to understand the roles their parents played during years of repression, violence, prison, and exile. Notably, the performers come from families all across the political spectrum from participants in the armed struggle on the left to the authoritarian paramilitary organization on the right along with those who had political preferences but tried to go along with the status quo. 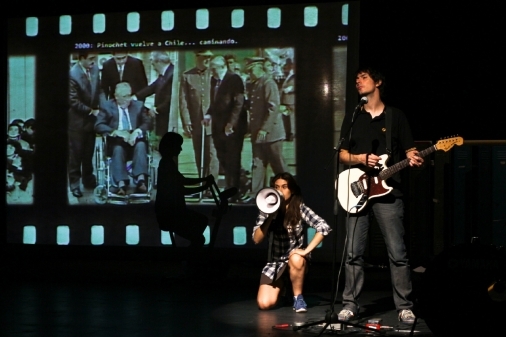 While the opening scenes of the play suggest the new generation’s commonalities, the picture becomes more complex and fractious (and comical) when the players are challenged to line up to show their political stance, their economic position – When it comes to poverty, does having a dirt floor at home trump going hungry? – and their social status as reflected in skin color. Simple yet inventive staging keeps the production lively with tonal shifts and surprise. Arias, from Argentina, previously created a similar program exploring the post-dictatorship era in her own country and if you’re familiar with Latin American politics, her work shouldn’t be missed. Know nothing about Allende and Pinochet? The production still fascinates. It runs two hours without intermission without ever inducing fidgets. Villegas and Arias made me think of another Latin American woman at the head of a company that uses documentary material – Claudia Santiago who writes, directs, and performs with Mexico City-based Espejo Mutable. Their most recent production, Náa-Gunaá, looks at the lives of indigenous migrants (including children) from the south of Mexico who are exposed to exploitation and pesticides as they harvest GMO crops in Baja California. The company would love the opportunity to share this work and explore the lives of indigenous migrants from Oaxaca in our own California fields. Puppet designer extraordinaire Janie Geiser directs Clouded Sulphur. Franco-Austrian director Giselle Vienne chose to employ simple hand puppets to create the unnerving effect in Jerk, the story of a serial killer. Theatre Movement Bazaar, with Tina Kronis as director and choreographer, continues its reinterpretation of Chekhov with Track 3. Diane Lefer is a playwright, author, and activist whose collaboration with Hector Aristizábal, Nightwind, has been performed in LA and in 30 other countries around the globe. Also in LA, her work has been presented by Grupo Ta’Yer at the Frida Kahlo Theater, Indie Chi Productions, Playwrights Arena, Three Roses Players, and Triumvirate Pi. She is co-author with Aristizábal of The Blessing Next to the Wound: A story of art, activism, and transformation as well as several anthologized essays about Theater of the Oppressed, and she has worked with theater groups in Colombia and Bolivia. Her works of fiction include the historical novel, The Fiery Alphabet, published this month, and the short story collection, California Transit, which received the Mary McCarthy Prize. Visit www.dianelefer.weebly.com.